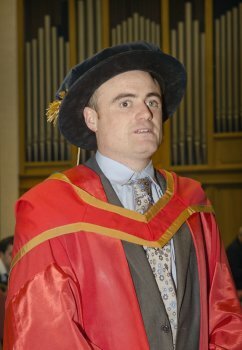 Belfast City Council should play a lead role in helping local communities to decide the future of peace walls, that’s the view of a University of Ulster lecturer who received a doctorate today for his research into the issue. Jonathan Byrne, a criminology lecturer from Belfast, carried out a three-year study of peace walls, under the guidance of Dr Cathy Gormley-Heenan and Dr Rachel Monaghan. The Army first erected the peace walls in 1969, in response to sectarian violence and disorder. Since then, there have been approximately forty-two walls constructed within urban working class Loyalist and Republican areas. Although Mr Byrne, who is based at the University’s Jordanstown campus, recognises the importance of Stormont in any process that involves the transformation of peace walls, believes Belfast City Council is better equipped to deal with this difficult and highly sensitive issue. “The research revealed that peace walls were viewed as a local issue that essentially required local solutions, and for that reason Belfast City Council has plenty of knowledge and experience dealing with sensitive issues such as bonfires, murals, flags and parades at the neighbourhood level. “Furthermore, the majority of MLAs at Stormont don't have peace walls in the areas they represent, but many councillors do. His PhD research also showed that the walls are interpreted very differently depending on which community you speak to and where they live in relation to the walls. Mr Byrne said: “Although community safety is of paramount importance, very often the social, economic and political issues that exist within these communities influence their thinking about the peace walls. For both Loyalist and Republican communities the discussion is more than about bricks and mortar and whether walls should remain or be removed. “A major concern for Loyalists are issues that relate to their history, identity and culture and for Republicans this is about addressing housing demand and being able to respond to the needs of an expanding population. “There is no doubting the complexities that surround the issue of peace walls. On one hand they are a constant reminder of the past, which appeal to the increasing number of tourists that visit the city, yet on the other hand they illustrate the distance people have to travel if we are to embrace the vision of a shared society.